Away from the glare of Europe's top five leagues, something special is brewing in the sprawling Greek port city of Thessaloniki. Having started the season with a points deduction after the club's president walked on to the pitch with a gun, PAOK Salonika are three games from being crowned champions of Greece for the first time since 1985. What's more, they are set to become the first side to win the title without losing a match since 1963-64. Their fine form has coincided with the arrival of former Arsenal forward Chuba Akpom on a three-year contract for a reported £2m. The Londoner has scored five goals in 17 top-flight appearances, including one against bitter rivals Olympiakos, since signing in August. "Everywhere I go, fans are always reminding me it's been 34 years since we last won the league," Akpom tells BBC Sport. "Football is a religion here. Supporters are always stopping to show me their PAOK tattoos. "When I flew over to sign, there were fans waiting for me at the airport. It's a whole new experience." Based in northern Greece, around 300 miles from the capital Athens, PAOK started this season on minus two points. It was part of a punishment after Ivan Savvidis, the club's president, walked on to the pitch with a gun 12 months ago. The Greek-Russian businessman had the weapon in a hip holster when he entered the field after PAOK had a late goal ruled out for offside during a game with AEK Athens, who went on to win the league. Savvidis is currently serving a three-year stadium ban for the incident, which led to the abandonment of the game, and has been restricted to watching his team on television as they edge towards becoming the first club outside Athens to win the league since 1988. "He's very well liked by our fans," added Akpom, who has played in the Europa League as well as the Champions League play-off round since leaving Arsenal. "They love him. He's very passionate." PAOK quickly made up the two-point deficit by winning the first eight league games, but when leading scorer Aleksandar Prijovic moved to Saudi Arabia to join Al-Ittihad for a reported 10m euros (£8.6m) in January, questions were raised about where the goals would come from. Step forward Canning Town-born Akpom. The departure of Prijovic, who went from loan spells in League One at Yeovil and Northampton 10 years ago to the 2018 World Cup with Serbia, paved the way for Akpom to make his first league start. Up until Prijovic's exit, the 23-year-old had been restricted to six substitute appearances in the league. The former England Under-21 international has started all 11 league games since, helping PAOK to nine wins, including crucial victories over Olympiakos and Panathinaikos. "I did my research before I joined," said Akpom, who consulted a former Arsenal team-mate for advice before moving to Thessaloniki, Greece's second largest city. "Lucas Perez said that I wouldn't want to leave PAOK if I signed. 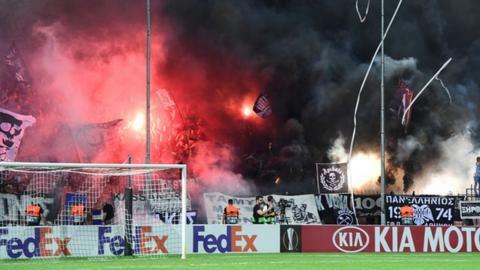 It sounds idyllic yet Greek football has been marred by crowd trouble in recent seasons and PAOK were deducted three points - but managed to overturn the sanction on appeal - after Olympiakos coach Oscar Garcia was hit by a toilet roll thrown from the stands at PAOK in February 2018. As recently as December, Greek Super League games were suspended after referees went on strike following an attack on an official outside his house. "A game I was playing in was stopped when a firework was thrown on to the pitch," added Akpom. "It's a football-mad country and fans arrive at ground well before kick-off - grounds are often packed when we step off the coach." Perhaps Akpom's finest moment so far for his new club came on 10 February in front of a sell-out 25,000 crowd - plus a substantial number of riot police - at PAOK'S Toumba Stadium, an old-school bowl nicknamed 'The Black Hell'. With his side leading Olympiakos 2-0 in one of Greece's biggest domestic fixtures, he dispossessed Pape Abou Cisse before sprinting clear to confidently curl in the third goal before attempting - and failing - to take off his shirt in celebration. PAOK, unbeaten in the league since 11 March 2018, won 3-1 to go nine points clear at the top. "It's natural there are more nerves the closer we're getting to the title," said Akpom. "It's been so long." Akpom joined Arsenal's academy at the age of six, made his debut for the under-18s aged 15 and at 17 was handed his Premier League debut against Sunderland. Then Gunners boss Arsene Wenger labelled him a "good talent" after he scored a hat-trick in a pre-season friendly against a Singapore Select XI in 2015. However, Akpom struggled to nail down a regular place and spent 2015-16 on loan at Hull City, helping Steve Bruce's side win promotion to the Premier League via the play-offs. The following campaign Akpom was involved in another promotion at Brighton, while he spent the latter half of last season in Belgium at Sint-Truiden. Speaking about his decision to leave the Gunners in the summer, Akpom, who is life-long friends with Arsenal forward Alex Iwobi, said: "I spoke to Unai Emery. "He just said that there's a lot of strikers and it would be hard for him to give me game time, which I respected. "Joining PAOK has given me a new life experience and we've got a great chance of doing something special this season. "Winning promotion with Brighton and Hull has stood me in good stead. I've learned from those experiences and it is helping me deal with what is happening now." Under former Romania boss Razvan Lucescu, PAOK have already secured a place next season's Champions League second qualifying stage - two rounds from the group stage. "I'd love that," said Akpom, when asked about his feelings of coming up against boyhood team Arsenal in the competition. "It would be a dream to play at Emirates Stadium again."